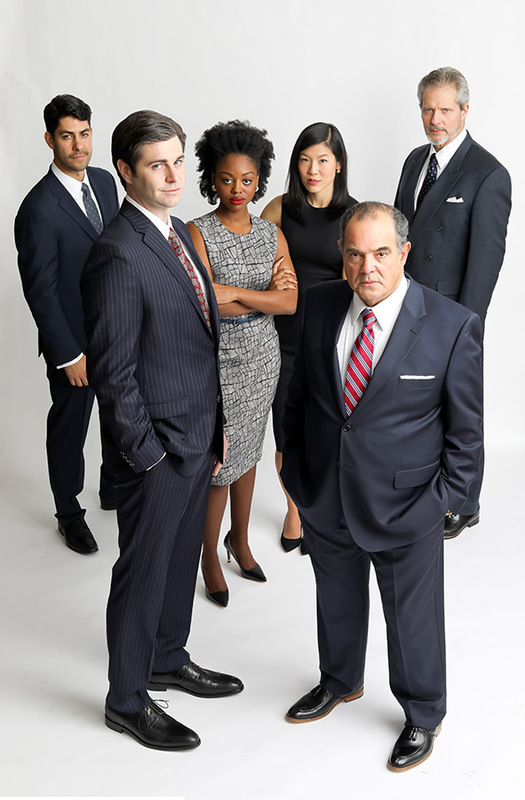 We spoke with Perry Young, who plays Raúl Rivera, the ruthless lawyer who helps Robert Merkin take over his family business. Some of the fictional characters in “Junk” have been inspired by real life people with names that are alliterations of the actual. For example, Junk bond trader Merkin might be like Mr. Milkin; Arbitrageur Boris Pronsky like Ivan Betsky; and the US Attorney Giuseppe Addesso like Rudolf Giuliani. Who do you feel is the attorney that inspired your character, Raúl Rivera? True, there are some serious parallels between the characters in the play to their real-life counterparts. In doing my own research, I came across the name Richard Sandler several times in connection to Michael Milken. They grew up together in California, went to high school together and were even in the same fraternity. Later, Sandler worked as a personal lawyer for Milken, as well as being a consultant for Drexel. Additionally, he is now currently a Trustee and Executive Vice President of the Milken Family Foundation. Given Raúl Rivera’s standing in “Junk,” I think there’s a high likelihood that he was inspired by Sandler. “Junk” promises to be thought-provoking, leaving the audience unsettled. What did you initially think of this play? Has being in rehearsals and developing your character changed any preconceptions? Oh man! I think it’s safe to say that my perspective on the play in regard to my character has taken many turns since rehearsals started. When I first read the play, I was struck by how well each character is able to brilliantly present their ideology and worldview. And for characters that I might find morally reprehensible, I really struggled with the fact that I agreed with a lot of the points they were making. My character is a perfect example of that—a sharp, cunning and ruthless lawyer who is willing to bend and even break the rules to ensure he and his client come out on top. As an actor, I relish the opportunity to play a character that operates by a completely different set of rules and ideals, even if I have a serious issue with their actions. But on day one of rehearsals, I come to find out that the playwright intended my character to be one of the protagonists! I think that really speaks to the brilliant writing and how even flawed characters can ultimately still be viewed in a positive light. This definitely has the possibility of leaving an audience unsettled with who they end up personally siding with. Compared to your other roles in television and on stage like the musical “In the Heights,” for which you won an award, this will be your first time performing at Arena. What has that been like? I am completely and utterly blown away by the production quality and attention to detail here at Arena. It’s a complete joy to go to work—and trust me, that is not always the case. They have set us up amazingly well by creating an environment of safety and comfortability, and now it’s our job to translate that into a successful show. This play is allowing me to dive into a text that is rarely found in television or musical theater, and really flex a different kind of acting muscle that I’m thrilled to work. The audience is likely to include lawyers, some probably like the one you portray, as well as other corporate types. What are your thoughts on that? What do you hope they take away? I have definitely been hyper-aware that my character exists in the world, and that I will likely be holding a mirror to some in our audience. I think it will be very interesting to see how he is perceived, and while I have my own personal bias, my job is to create a three-dimensional character, flaws and all. He is right, he is wrong, he is loyal to a fault, and in many ways, he comes out victorious in the end. But the big question I hope they walk away with is: What are you willing to sacrifice in order to win? Anything else to add about working with this show, this company, this director? Jackie Maxwell is a genius. Well, maybe like a mad scientist! She has refreshingly honest and direct way of communicating her vision, without being pretentious or overbearing. It’s been an absolute dream working with her and my fellow cast mates. I feel that we’ve already established a phenomenal rapport, and the level of talent on that stage is astounding. I am so thankful to Arena for the opportunity to present this piece that is meaty and relevant, especially now in the current state of our country.